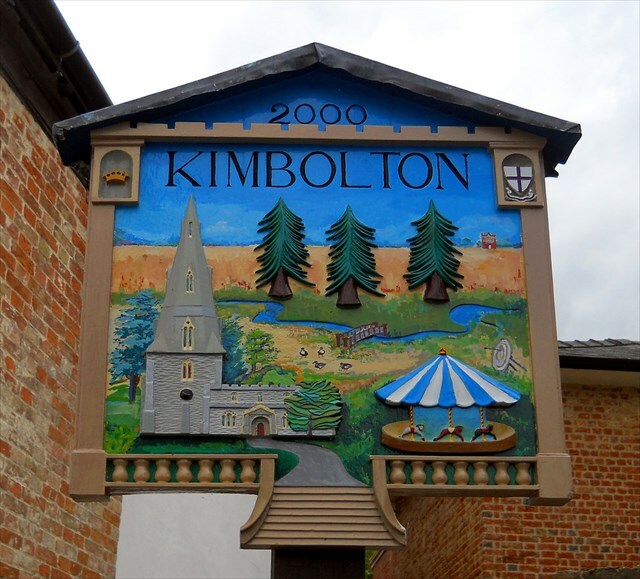 Kimbolton is a large village in the Huntingdonshire district of Cambridgeshire, England. It is approximately 7 miles (11 km) east of Higham Ferrers, 7 miles (11 km) west of St Neots and 24 miles (39 km) west of Cambridge, 14 miles (23 km) north of Bedford and 31 miles (50 km) south of Peterborough and also includes the hamlet of Stonely. The centre of the village is Kimbolton Castle which now forms the main building of Kimbolton School (an independent day and boarding school), but its predecessor on the same site was once home and prison to Katherine of Aragon after her divorce from Henry VIII. Katherine died at Kimbolton Castle in 1536 and was transported from there to Peterborough Cathedral to be buried. Kimbolton, and the lands of its soke, comprised the only estate of King Harold in Huntingdonshire. It is believed that Harold had a hunting lodge nearby. Kimbolton and its church, St Andrew's, appear in the Domesday book, compiled in 1086. Many members of the Montagu family (Earls and Dukes of Manchester of Kimbolton Castle) are buried at St Andrew’s Church. Several Montagu monuments still exist in the South Chapel, while the Montagu vault (extended in 1853) is located beneath the North Chapel. The main road through Kimbolton bends through four tight right angles in quick succession. Originally, the road traveled directly through the outskirts of the village, nearer to the River Kym to the north. The parish also includes the hamlet of Stonely, the site of a former Augustinian priory. In 1200, a prominent local landowner, Geoffrey Fitz Peter, Earl of Essex and Chief Justice to King John, who constructed the first castle on the present site, received a Royal charter to hold a market and fair in Kimbolton. There is still a fair every September, known as the "Statute Fair" - referred to affectionately by locals as the "Statty". Continuation of this fair (despite the chaos which formerly ensued when this meant partial closure of a trunk road) and a plaque marking the site of the market cross are claimed by some as evidence that Kimbolton is a town and still has a right to hold a weekly market. The main road was diverted to its present course to take it through the market place and increase toll revenue. 800 years later, as a result of numerous vehicles striking walls and houses near the sharp bends, car transporters are not allowed in the village. Oh, and don't forget the fireworks!